Utah is weighing its options: rely on feds or assume greater control. Paul Fraughton | The Salt Lake Tribune Workers on the beach at Willard Bay State Park work on the cleanup of a diesel fuel spill at the park. Wednesday, April 10, 2013 Al Hartmann | Tribune file photo Workers look at an impacted area from a leak from a Chevron pipeline between Willard Bay North Marina and I-15 Tuesday March 19. The leak was detected Monday. 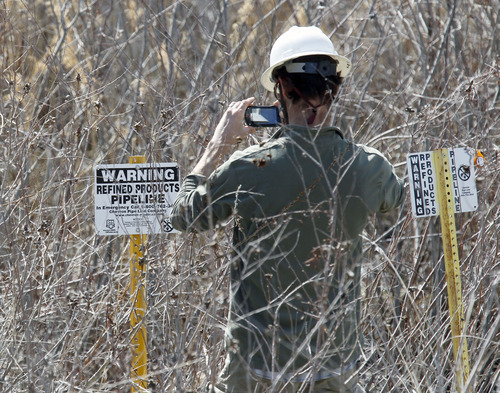 Al Hartmann | The Salt Lake Tribune A man photographs a pipeline sign near a petroleum spill in a wetland area between Willard Bay North Marina and I-15 Tuesday March 19. The leak was detected Monday. Authorities said the leak was contained in retaining ponds and none went into Willard Bay. Cleanup crews will wrap up their work soon at Willard Bay State Park and return it to boaters and picnickers, birds and wildlife. They&apos;ve been sopping up petroleum from the marshes, beaches and campgrounds on the edge of the Great Salt Lake in the 10 weeks since a busted pipe seam leaked more than 20,000 gallons of diesel fuel. Now they&apos;re preparing to pack up the heavy machinery bivouacked at the park and return the place to a happy normal. Meanwhile, at the Utah Capitol, leaders have been grousing that big spills like this have become all too normal. And, after Chevron&apos;s third major leak in three years, they&apos;ve hinted at overhauling Utah&apos;s pipeline safety program. Will leaders continue to leave the job to the federal Pipeline and Hazardous Materials Safety Administration (PHMSA)? Or will they abandon the current hands-off approach for greater control of pipeline safety, like other states? Critical as leaders have been of federal oversight, no one&apos;s saying yet whether Utah&apos;s ready to assume the kind of authority over pipelines that&apos;s long been available to states. Utah&apos;s options • Gov. Gary Herbert is still considering the options, said his deputy chief of staff, Ally Isom. "This complicated pipeline issue is fraught with legal, policy and financial considerations, all of which are presently under review by the governor&apos;s legal team," she said recently. "We will evaluate other states&apos; actions and determine what is in Utah&apos;s best interest," she said in an email statement. "In the end, our driving objective is to better work with federal partners to ensure these pipelines are safe." As it turns out, Utah already has authority over some of the 22,500 miles of pipeline within its borders, according to Department of Commerce spokeswoman Jennifer Bolton. The Division of Public Utilities keeps tabs on around 16,575 miles of lines that deliver natural gas to homes and businesses. But the 6,000 miles of big, high-pressure lines that transport natural gas, petroleum and other hazardous liquids across state borders  Utah leaves that to the federal government. "But that&apos;s just because the state hasn&apos;t chosen to take any authority over pipelines  not that they can&apos;t," said Carl Weimer, director of the nonprofit Pipeline Safety Trust. 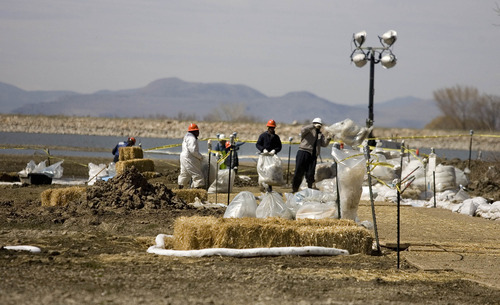 A citizen watchdog group based in the Washington state community where a 1999 natural gas pipeline explosion killed two boys, the trust was commissioned to study pipeline safety here after the Chevron spills above the Salt Lake Valley in 2010. The report&apos;s top suggestion: a hands-on approach by state government. 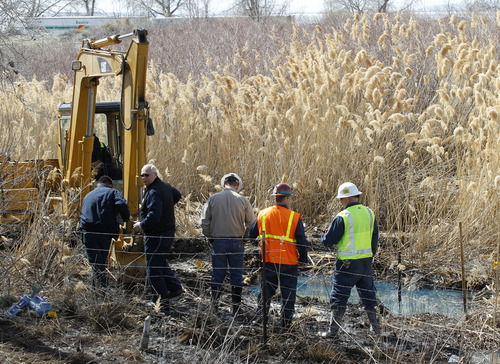 "What Utah has seen," said Weimer in a recent interview, "is that these incidents will continue to happen until someone steps up and takes responsibility for pipeline safety." Out of the loop • By the time of the report last fall, cleanups were largely done after the failure  twice  of a Chevron pipeline near Red Butte Garden in 2010. About 54,600 gallons of Chevron&apos;s syrupy, dark crude oil had sullied Utah&apos;s environment in June and December of that year  spewing toxic chemicals into the air, coating city creek beds and pooling in busy Liberty Park. The cleanup, the penalties and compensation to affected residents, local governments, the state and federal agencies totaled around $43 million. But, even with a civil lawsuit still pending, the company&apos;s aging diesel-distribution line ruptured at Willard Bay State Park&apos;s North Marina on March 18. Part of a 760-mile, 60-year-old line that runs from Salt Lake City&apos;s five petroleum refineries to Spokane, Wash., the repaired pipeline has since been approved to run at 80 percent pressure after it sprung another leak during its full-throttle stress test. "If the state had any inspectors, these incidents would be less likely to happen to them," Weimer added. "You might catch them before they [pipeline operators] start dumping into places like Willard Bay." And the state might just have more regulatory muscle. For instance, the Weber Basin Water Conservancy District wasn&apos;t informed until after the fact last month that PHMSA, the federal pipeline agency, had OK&apos;d Chevron&apos;s plan to restart the line at partial power. At the time, the water district was keeping an eye on the traces of diesel that had already contaminated its reservoir at Willard Bay, an irrigation resource that might someday be tapped for drinking water. But locals weren&apos;t the only ones out of the loop. The governor wasn&apos;t informed the pipeline had been restarted until a meeting days afterward. Then again, the current pipeline-oversight structure does not give the state the authority to demand more, said Walt Baker, who has helped oversee all three Chevron cleanups as director of the Utah Division of Water Quality. A proactive stance • Weimer notes that other states have chosen to assert their authority over pipeline safety  and for good reason. "Even PHMSA admits they are spread thin," said Weimer, who called it "an underfunded, forgotten agency in the federal government." Weimer noted that the federal agency has roughly 120 inspectors to watchdog 2.6 million miles of pipeline. So the agency doesn&apos;t necessarily walk the lines to check for safety; it mostly reviews the paperwork submitted by pipeline operators. He pointed out that, thanks to a matching grant program that provides up to 77 percent of the cost of state oversight, Utah could hire more inspectors "and provide another layer of safety." "You have more eyes and ears in the field when the state has more authority," Weimer said. In states such as Washington, state and federal regulators are full partners. Joe Subsits, who oversees pipeline safety in that state, said his team can double-check the work of pipeline companies, prioritize the risk of lines there and even walk the pipeline alongside federal regulators. "We&apos;re pretty much the eyes for PHMSA in Washington state," he said. In contrast, Utah hasn&apos;t opted for even simple measures that would increase the involvement of the government and the public, according to the Pipeline Safety Trust. For instance, Utah&apos;s pipeline-safety office could post inspection reports and other useful data for the public, but it does not, the trust report noted. Another example: A 2011 best-practices guide by the National Association of Pipeline Safety Representatives  it details 1,154 safety tips suggested by the states  does not include a single suggestion from Utah. Only three other states were silent like Utah  Montana and the Dakotas  Weimer noted. Salt Lake City Mayor Ralph Becker earned praise from Weimer for his hands-on response to the Red Butte spills and his vow to take the report to the Legislature. But the 2013 general session came and went without advocacy on the issue from Becker. Art Raymond, the mayor&apos;s spokesman, said recently Becker had been in touch with Amanda Smith, executive director of the Utah Department of Environmental Quality, and got the message that more oversight was "out of our purview." "We don&apos;t have a pipeline enforcement card to play," Raymond said of the city. Rep. Brian King, a Democrat whose district includes some of the east Salt Lake City neighborhoods damaged in the Red Butte spills, asked the Legislature&apos;s lawyers this month to start drafting a bill to stiffen penalties for pipeline spills and increase compensation for agencies that have suffered damages from them. "I want to take a hard look at it," King said. "To the extent we have the authority to do so, we ought to do it." Meanwhile, the Herbert administration continues to study Utah&apos;s options. "Obviously, [federal regulators] have not done a very good job of overseeing the pipes that travel between our states," he angrily told reporters the week after the Willard Bay spill, "and this is just not an acceptable situation." He vowed: "We need to take a more proactive stance as a state." But exactly what that proactive stance might look like has yet to be seen.